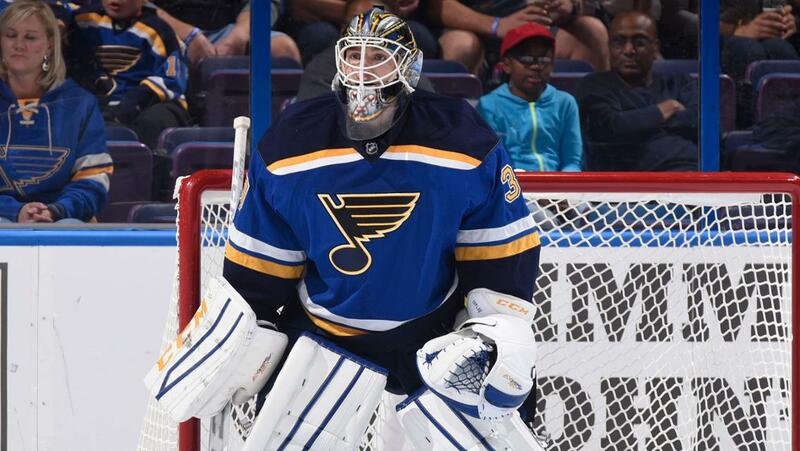 After a 7-3 beating last night against the NHL’s top team, the Blues have decided to leave their #1 goaltender at home for the upcoming road trip. Allen was pulled for the third time in three games and seems to have had a complete break down between the pipes. His GAA has climbed to a whopping 2.85, while his save % is an abysmal .897, so it makes sense why he will not be playing for the next few games. Mental, physical, what ever the problem is, he needs to figure it out, and do it quickly. The front office is running out of time to figure out what they plan on doing for the future of the franchise and if this season has shown anything, it has shown mistakes have been made, and they need a clear path to follow sooner rather than later. The top paid players this franchise has committed to, need to start living up to their contracts. Players that could have stayed, left, and players that could have left, stayed. Hindsight is always 20/20, but the talent of this team needs to start showing why they have gotten these contacts. Bouwmeester is the 33rd highest paid defenseman in the league, but offensively, he’s ranked as the 108th. Stastny has been up and down and he is a top overall player, but offensively, he is lackluster. Gunnarsson, Lehtara, and even Steen have not been the players St. Louis expect. Of all the players I have listed that are underachieving, the heaviest burden has to fall on the shoulders of Allen. Maybe it was a year early, maybe this is what he is, but most of all…maybe he should figure out how to play up to his ability and give this team someone they can fall back on when they have a bad night! There are some tough decisions that are going to have to be made in the near future. With the trade deadline looming, Armstrong is going to have to decide if this season is worth the chance of continuing, or if it’s time to secure the future. Shattenkirk can bring in a substantial package in a trade, but if you do in fact trade him, that all but shows this season is over. The Blues are still sitting in a playoff spot and have time to bring a sense of hope back to the city for a deep playoff run. It has been done in the not so distant past. So, is it time to throw in the towel, or is it time to see what you can do by the deadline to improve this team for the postseason? I have heard that there are goaltenders available to bring in, if the price is right of course. I don’t know what the asking price is going to be, but Marc-Andre Fluery is intriguing to me. Playoff tested, Pittsburgh is going to want something for him with the expansion draft coming, and the Blues aren’t looking for a long term sign at this position. Do you give them Shatty for him? I don’t think so, but maybe a Gunnarsson or Boumeester, or another player (or two) plus a prospect or draft pick? Why not? What I would like to see this club do by the trade deadline is simple…relieve yourself of enough money to be able to keep Shatty. Will it happen? Probably not, but the Blues have enough average/above average players (whether they are performing up to task, or not) that may be appealing to teams that just need the depth, or are a player short of what they need, to knock enough cap space off to make it happen. I know this may be far fetched, but Shatty may be one of those players that gets traded away and you end up regretting it the next day. The last thing this team needs is a repeat of Scott Stevens. Different circumstances led to Stevens leaving for the Devils, but ultimately one of the best defesemen in the league will be leaving St. Louis again. Will the call up of Copley give Allen the competitive drive that pushed him last season? We all hope so, but it’s hard to be to optimistic about it. Throw the kid in the fire and see what he’s got! You are on a deadline and the clock is ticking. Not just on the season either. The clock is ticking on Hitch. Let’s right this ship and give him a proper send off, or make sure the Blues future is not in jeopardy because you didn’t make the necessary moves. Either way, this city is holding their breathe, waiting to see if they can get back to the beginning of the year when they were pumped for “this is the year”, or can come to the realization that it’s another “next year” type of season. Go get a 3rd line center, a goaltender, and keep Shattenkirk, or trade him, either way, do what is necessary to continue the rise of this team, so St. Louis doesn’t have to go back to Sing’n the Blues.